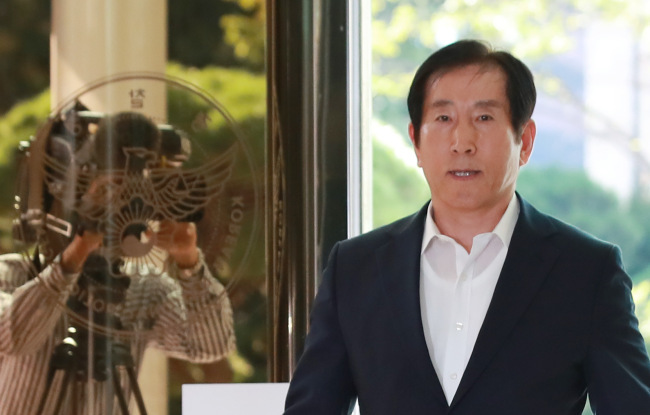 Police questioned former national police chief Cho Hyun-oh for the second time in a week Wednesday about allegations that he masterminded cyber operations to post Internet comments favorable to the government of then-President Lee Myung-bak. Cho, who served as commissioner-general from 2010-2012, is accused of mobilizing National Police Agency units to write more than 40,000 Internet comments in an effort to help form positive public views of the Lee administration. It was his second questioning, following the first a week ago. After arriving at the National Police Agency, Cho refuted the allegations. "I instructed police across the nation to respond actively to those denouncing police with false facts and I also ordered this officially during an open meeting," Cho told reporters. "How can this constitute political maneuvering and opinion-rigging?"